Winter storms can vary from a light snowfall to blowing nor’easters that can immobilize an entire region. Many winter storms bring ice, strong winds, and subfreezing temperatures with them as well as snow. Large winter storms can be quite dangerous. A half-foot of snow can make unplowed roads impassable. Even a few inches of dry snow can form drifts many feet high under windy conditions, burying houses and making roads impassible. Trees can be brought down by the weight of dense wet snow, snapping power lines and damaging houses as they fall. Winter storms can cut off heat, power and communications to your home or office, sometimes for days at a time. Hurricane-like storm surges are possible along the coast from winter storms with high sustained winds. Deaths can occur from hypothermia, infections brought on by frostbite, car accidents due to slippery roads, fires or carbon monoxide poisoning from faulty heating methods after a storm causes a power outage, or heart attacks caused by overexertion while shoveling heavy wet snow. Warm temperatures immediately following a heavy snowfall can lead to ice jams and flooding from excessive snow melt. 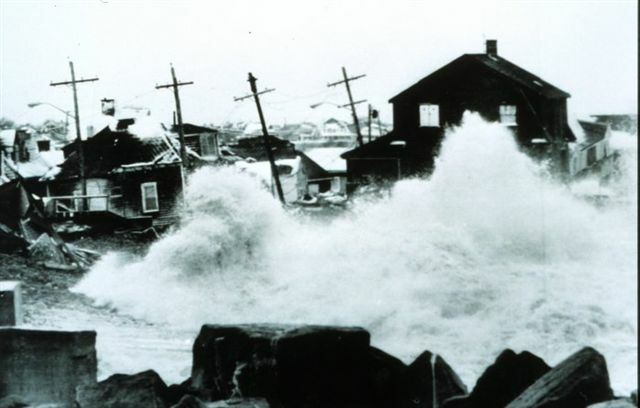 The northeast has a long history of severe winter storms and blizzards. The most severe winter storm to ever hit the Northeast was the Great Blizzard of 1888, also known as The Great White Hurricane which lasted for several days from March 11th to the 14th. Record snowfalls of 40 to 50 inches fell in parts of New Jersey, New York, Massachusetts and Connecticut. Sustained winds of over 45 miles per hour produced snow drifts excess of 50 feet. Boston had up to nine inches of slush on the ground. Railroads were shut down and people were confined to their houses for up to a week. 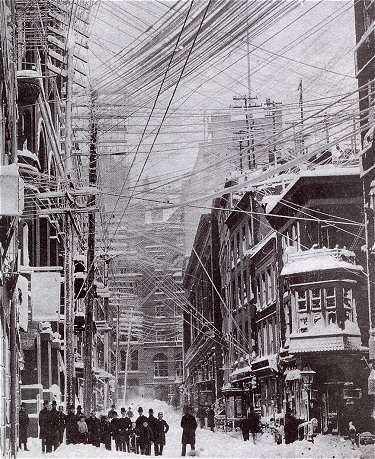 Hundreds of power lines fell on many city blocks from the unrestrained forests of telephone poles erected in the 1800s, further obstructing streets already clogged with snowdrifts. Fire stations were immobilized, and property loss from fire alone was estimated at $25 million. The transportation gridlock as a result of the storm led to the creation of the New York subway system, which was approved in 1894 and begun in 1900. All imports were stopped, and fuel was scarce. Many people starved and died from lack of proper nutrition. 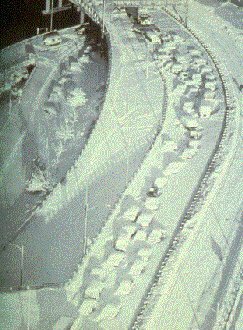 More recent blizzards and snowstorms occurred in March of 1993, February of 1996, March of 2001, and February of 2006. 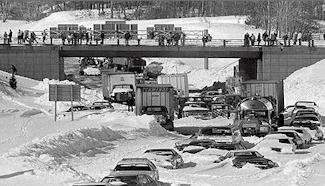 While these events were as damaging than the Blizzard of ’78, they still claimed lives, caused millions of dollars in damage and left thousands without power for days. What is the Risk from Winter Storms in the Northeast? What types of winter storms are there? There are three kinds of major winter storms. Blizzards are severe winter storms with 35 mph winds, considerable amounts of snow, and reduced visibilities of 1/4 mile or less, lasting for 3 hours or longer. Extreme cold and whiteout conditions are often present with blizzards as well. 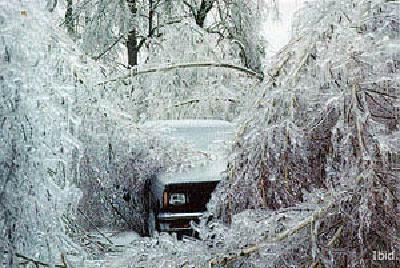 Ice Storms are winter storms with freezing rain or sleet instead of snow. Ice storms are one of the most dangerous types of winter storm, as they create a coating of ice which snaps tree branches, downs power lines, ruins crops, and makes driving extremely hazardous. These storms tend to cause widespread power outages from snapping power lines and falling trees. Nor’easters are large storm systems whose winds generally come from the northeast. Nor’easters can also cause coastal flooding, coastal erosion and gale force winds. What is the Risk of a Winter Storm Occurring in the Northeast? The Northeast generally experiences at least one or two major winter storms each year with varying degrees of severity. These major storms can make roads impassible, close airports, halt the delivery of goods and services, and leave thousands without power for days. Where is the Biggest Risk from Winter Storms? Rural areas are most at risk of loosing power and becoming isolated during a winter storm. Snow clearing and power restoration efforts take much more time in rural areas than along highways and in urban areas. When preparing for a severe winter storm, rural residents in the Northeast should keep in mind that it could be hours, or even days, before emergency personnel are able to reach them. Residents should plan to stay inside and make it on their own, at least for a period of time. Since severe winter storms often produce high winds and a storm surge, the coastline is more vulnerable to winter storms than most people realize. 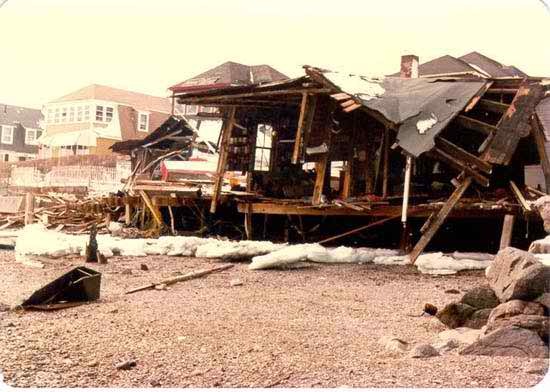 During the Blizzard of ’78 many homes along the New England and Long Island coastlines were destroyed or washed into the ocean. The coastline is highly developed in the Northeast, and is at significant risk from severe winter storms. When Are Winter Storms Most Likely? In the Northeast, winter storms can occur from late September through late April. The most severe winter storms typically occur during January and February. People who travel in winter storms are at the most risk. 70% of winter storm-related deaths occur in cars, more than the number of people caught out in the storm. The elderly are also at risk due to poor health and frequent isolation. People over 60 years of age account for half of all exposure-related deaths. Can You Measure the Severity of Winter Storms? Yes. The Northeast Snowfall Impact Scale (NESIS) was created to measure high-impact snowstorms in the U.S. Northeast in much the same way the Saffir-Simpson Hurricane Scale records hurricane intensity. NESIS was created by Paul Kocin of The Weather Channel and Louis Uccellini of the National Weather Service, and contains five storm categories: Notable, Significant, Major, Crippling, and Extreme. NESIS values are calculated for heavy winter storms with large accumulations (10 inches or greater). Meteorologists measure the storm’s area, the amount of snowfall, and the number of people living in the path of the storm. This information is used to calculate a NESIS Value for the storm, with 1 for a Notable storm, and 10 or higher for an Extreme storm. Since NESIS includes population information, NESIS values are also used as an indication of a storm’s economic impacts. Listen to commercial radio, television, the internet, or NOAA Weather Radio for winter weather reports, watches, warnings, and other emergency information. Keep in mind that during a severe winter storm it could be hours, or even days, before emergency personnel are able to reach you. Plan to stay inside and make it on your own for awhile. The more you plan ahead for severe winter storms, the better of you will be. Help elderly or disabled friends, neighbors or employees stay safe and warm during the storm. Check up on them, shovel their walkways, and invite them into your home if necessary. Conserve fuel, if necessary, by keeping your home cooler than normal. Lower the thermostat to 65° during the day and 60° during the night. You can also close the doors to unused rooms and lower the heat in those rooms. Cover windows at night with heavy drapes to help keep in. 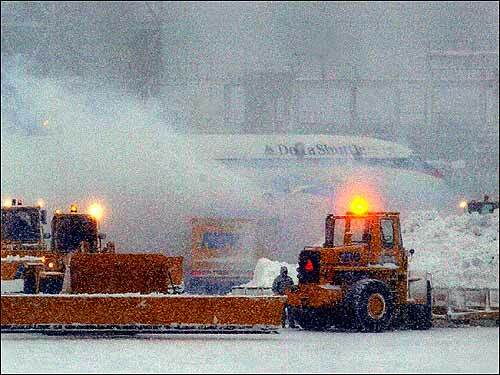 Fuel carriers may not reach you for days after a severe winter storm. If your pipes freeze, locate the section of pipe that is frozen. Temporarily remove any insulation and wrap frozen pipes in layers of rags or newspaper. Completely open all faucets and pour hot water over the frozen pipes, starting where they were most exposed to the cold. A hand-held hair dryer, used with caution to prevent overheating, also works well. If you are using kerosene heaters in your home, follow the safety instructions carefully, and maintain ventilation to avoid the build-up of toxic fumes. Use only the correct fuel for your unit and follow the manufacturer’s instructions. Use a carbon monoxide alarm to warn you if carbon monoxide builds up in your home. Refuel kerosene heaters outside, and only then when they are cool. Keep kerosene heaters them at least three feet from flammable objects. Ensure that dryer vents and heater exhaust pipes are clear of snow, and shovel snow away from these vents if you can. Avoid overexertion when shoveling snow. Overexertion can bring on a heart attack, which is a major cause of death in the winter. If you must shovel snow, stretch before going outside, take it easy, and take frequent breaks. Dress warmly in dry clothing. It is better to wear several layers of loose fitting, lightweight, warm clothing rather than one layer of heavy clothing. Trapped air between layers of clothing insulates best. Layers can also be removed to avoid perspiration and subsequent chill. Your outermost garments should be tightly woven and water repellent, such as a good down coat. Wear mittens, which are warmer than gloves. Wear a hat as well, since most of your body heat escapes through your head. Eat regularly and drink ample fluids. Food provides the body with energy for producing its own heat. Keep the body replenished with fluids to prevent dehydration while working outside. Be sure to keep dry. Change wet clothing frequently to prevent a loss of body heat. Wet clothing looses its ability to keep you warm and increases your chances of hypothermia. To avoid cramps, stretch before going outside. If the air is extremely cold outside, protect your lungs by covering your mouth with a scarf or ski mask. Try not to talk unless necessary. Do not eat snow, as it will drastically lower your body temperature. If you need to use snow for water, melt snow first. Watch for signs of frostbite. Generally, symptoms of frostbite include: discoloration of the skin with burning and/or tingling sensations, partial or complete numbness, and possibly intense pain. If left untreated, frostbitten skin gradually darkens after a few hours. Skin destroyed by frostbite is completely black, looks loose and flayed, as if burnt. If symptoms are detected, move the victim to a warm, safe area, and get medical help immediately. Watch for signs of hypothermia. Hypothermia is a dangerous and in some cases fatal condition where the human body cannot keep itself warm enough to survive. Hypothermia can develop whenever people are exposed to the cold. In some cases, even mildly cold weather can eventually lead to hypothermia. Victims of hypothermia should be treated immediately when symptoms are observed. The major initial sign of hypothermia is excessive shivering and a decrease in mental function that leads to an impaired ability to make decisions. Tiredness or lethargy, slurred speech, stumbling, incoherence, and disorientation are typical. The person will act as if they are “drunk”. Shivering is usually uncontrollable at first, but later the victim looses the ability to shiver as hypothermia worsens. Eventually, the person cannot walk or stand, and this is followed by drowsiness, consciousness and death. Extreme exposure to cold, such as a fall into cold water or wearing wet clothes on a windy wintery day, is likely to cause hypothermia. The first thing to do is to reduce heat loss by getting the victim out of the cold. Move indoors to a warm location. Replace wet clothing with warm, dry clothing, as wet clothing pulls heat away from the body. If you are stuck outdoors, protect the person from the wind, cover their head, and insulate their body from the cold ground. Prepare a lean-to, wind-break, or snow cave for protection from the wind. If you can, use additional heat sources: wrap the victim in a blanket, make a camp fire if you know how, or huddle in a sleeping bag with the victim. Dial 911 or call for emergency medical assistance for anyone displaying signs of hypothermia. While waiting for help to arrive, monitor the person’s breathing. If breathing stops or seems dangerously slow or shallow, begin cardiopulmonary resuscitation (CPR) immediately. Do not apply direct heat to the body. Do not use hot water, heating pads, or heating lamps on the victim. Instead, apply warm compresses to the neck, chest, sides, and groin. Don’t try to warm the arms and legs. Heat applied to the arms and legs forces cold blood back toward the heart, lungs and brain, causing the core body temperature to drop. This can be fatal. Do not give alcohol. Alcohol makes a person feel warm, but in reality alcohol lowers their internal body temperature. If the victim is conscious and not vomiting, give themwarm, nonalcoholic and decaffeinated beverages. Don’t massage or rub the person. Handle people with hypothermia gently as they are at risk of cardiac arrest. Unless it is absolutely necessary, refrain from traveling during a winter storm. If you must drive, travel during the day and do not travel alone. Tell others where you are going, your timetable and primary and alternate routes, in case you get stuck. Keep your gas tank full to avoid ice in the tank and fuel lines. Your car engine will be your main source of heat if you get stuck. Stay on well-plowed main roads and avoid back road shortcuts. If you get stuck on the highway, pull off the road if you can. Turn on hazard lights and place a help sign in your window, or hang a distress flag from the radio antenna. Stay in the car during the storm. While in your vehicle where you will have shelter from the elements, and rescuers are most likely to find you. Set out on foot only if you can see a building close by where you know you can take shelter. Be careful, as distances can be distorted by blowing snow. A building may look close, but it can really be too far to walk to in deep snow. If you must leave your car, do it once the storm passes. Run the engine and heater about 10 minutes each hour to keep warm. When the engine is running, partially open a downwind window for ventilation and periodically clear snow from the exhaust pipe. This will help to protect you from carbon monoxide poisoning. In extreme cold, use road maps, seat covers, and floor mats for insulation from the wind and cold. Huddle with passengers and use your coat for a blanket. Watch for signs of frostbite and hypothermia. Drink fluids to avoid dehydration, and avoid caffeine and alcohol. Be careful not to waste battery power. You do not want to kill your car battery while you still have gasoline. Be conservative with the use of lights and radio, and run fans and heaters with the engine on. If the car battery starts to die out, run the car engine to recharge it. When the engine is running, partially open a downwind window for ventilation and periodically clear snow from the exhaust pipe. This will help to protect you from carbon monoxide poisoning. At night, turn on the inside dome light when the engine is running so that work crews or rescuers can see you. Flooding and ice jams can occur from thaws after a severe winter snowstorm, so be prepared for these disasters during the winter as well. Make sure your family has clothing warm enough for the winter season. Make sure your family knows what to do if they are caught in a winter storm. Everyone should know what to do in case all family members are not together at the time the storm hits. Add the following supplies to your Disaster Supply Kit in your home to help prepare you to a winter storm: rock salt or sand to melt ice and improve traction, and snow shovels or other snow removal equipment. Have sufficient heaters and plenty of fuel on hand in case the the power goes out or your regular fuel shipments are cut off. For example, store a good supply of dry, seasoned wood for your fireplace or wood-burning stove. Or install a permanent, propane-fed standby power generator to keep your furnace running through a power outage. If you plan to use kerosene heaters if the power goes out, check with your local fire department on the legality of using one in your community. Keep fire extinguishers on hand, and make sure everyone in your house knows how to use them. The risk of house fires increases during a winter storm, as more people turn to alternate heating sources without taking the necessary safety precautions. Install carbon monoxide alarms to warn you if carbon monoxide builds up in your home. Most alternative heating sources can release carbon monoxide if set up improperly, and even properly maintained furnaces can release carbon monoxide into your home if outside exhaust vents are choked with snow. Winterize your home to extend the life of your heating fuel supply. Insulate your walls and attics. Caulk and weather-strip your doors and windows. A lot of heat is lost from your home through single-pane windows, even when they are closed and caulked. If you have single-pane windows, install storm windows or cover them with interior or exterior plastic sheeting. Winterize your barn, shed or any other structure that you will need for livestock or equipment that cannot be frozen. Clear rain gutters; repair roof leaks and cut away tree branches that could fall on a house or other structure during a storm. Insulate your pipes with fire-rated pipe insulation, or newspapers and plastic if you don’t have time to buy insulation before the storm hits. Allow faucets to drip a little during cold weather to avoid freezing. Service snow removal equipment before winter storm season. Equipment should be available for use if needed. Maintain it in good working order. Install snow fences in rural areas to keep snow drifts off of roads and paths, which could block access to homes, barns, and animals’ feed and water. Hire a contractor to check the structural ability of your roof to sustain the heavy weight of snow. This is especially important if you have a flat roof, as water can also collect on your roof if drains are clogged with ice and snow during a storm. If you live in a flood-prone area, consider purchasing flood insurance to cover possible flood damage that may occur during the spring thaw. Homeowners’ policies usually do not cover damage from floods. Ask your insurance agent about the National Flood Insurance Program if you are at risk. Get first-aid training. Take an American Red Cross first aid course to learn how to treat exposure to the cold, frostbite, and hypothermia. Use good winter tires. Make sure the tires have adequate tread. All-weather radials are usually adequate for most winter conditions, but roads in some areas will require severe snow tires. Purchase a set of tire chains if you are in a remote area or an area with a lot of snow. Purchase the right size chains for your tires. Know how to attach them properly, and know how to drive with them. Keep your speed below 30mph while driving with chains, and avoid driving on dry pavement with chains. After driving for a short while, you should tighten the chains a second time. Chains that come loose should be refastened before they wrap around your vehicle’s axle, which can cause damage to your car. Antifreeze levels should be sufficient to avoid freezing in cold winter weather. Your ignition should be in top condition, your car battery should be strong, and your battery terminals should be clean. Your exhaust system should be free of leaks and crimped pipes. Repair or replace parts as necessary. If your car gets stuck in a winter storm, a leaky exhaust system could fill your car with dangerous carbon monoxide even if the tail pipe is clear of snow. Your brakes should be free of wear, and brake fluid levels should be high. Stopping is already difficult during a winter storm, and you don’t want to make the situation worse. Keep your fuel tank full during a storm. Your car engine will be your main source of heat if you get stuck. Check your oil, and use a lighter engine oil during the winter. Heavier oils congeal more in cold temperatures and do not lubricate as well. For winter weather, your heater, defroster, thermostat, and hazard lights should all work properly. Mitigation is the cornerstone of emergency management. Mitigation the ongoing effort to lessen the impact that disasters have on people and property through actions taken before a disaster strikes. Mitigation includes actions such as keeping homes away from floodplains, engineering bridges to withstand earthquakes, creating and enforcing effective building codes to protect property from hurricanes, installing smoke detectors in a home, and much more. Include winter storms in local emergency management plan. Identify appropriate shelters for people who may need to evacuate due to loss of electricity, heat or coastal flooding due to storm surge from severe winter storms. Ensure that adequate supplies of sand, salt, and snow removal equipment are available, maintained, and ready to be deployed. Ensure that roads to critical facilities such as police and fire stations are kept accessible. Ensure that Administrators of schools, shopping centers, nursing homes, hospitals, sports arenas, stadiums, mobile home communities and offices have a shelter-in-place safety plan, with food stores for a few days if necessary. Include procurement and distribution of NOAA Weather Radios schools and other key facilities in their community mitigation programs to monitor weather forecasts, conditions and warnings issued by the National Weather Service. 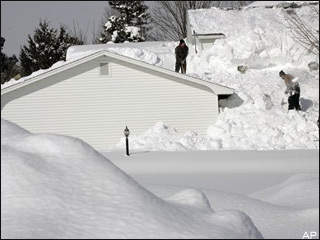 Ensure the development and enforcement of building codes for roof snow loads. Retrofit public buildings to withstand snow loads and prevent roof collapse, or clear have plans in place to clear roofs of excessive snow accumulations. Roofs need to sustain the unusually heavy weight from snow accumulation, or water if drains on flat roofs do not work. 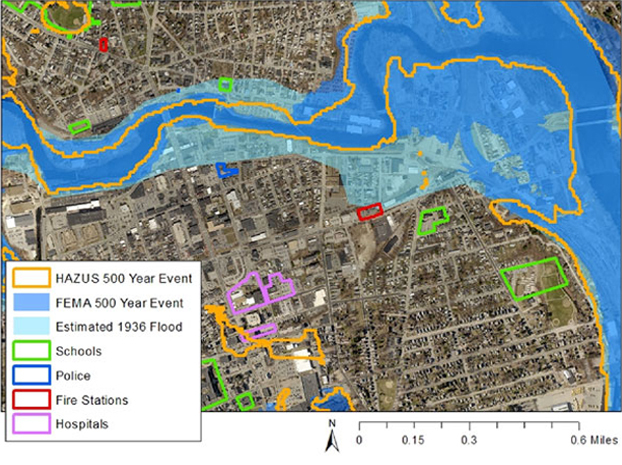 Include snow melt in storm water management plans. Check the “Things You Can Do Today” section above. During winter storms, there is an increased risk of fire when people lose electricity and use portable heaters, gas stoves, and candles for heat and light. House fires are especially dangerous during winter storms because it is difficult for fire trucks to get to the fire when the roads are buried in snow. The leading cause of death during winter storms is from automobile or other transportation accidents. Exhaustion caused by overexertion is the number two killer. Wind chill is a cooling effect caused by the combination of strong winds and cold temperatures. As wind speeds increase, heat is carried away from a person’s body at an accelerated rate, driving down body temperature. In weather forecasts, “wind chill” is an estimation of how cold it feels when the effects of wind speed and cold temperatures are combined. Strong wind combined with freezing temperatures can quickly create a wind chill that is well below 0°F.